Due to weather and road conditions, the regular meeting scheduled the December 10th was moved to tonight. The meeting was called to order at 7:00 PM in the township office with all Supervisors present. Visitors were Ted Brewster, Maureen Warren, Conrad Owens and Phil Medico representing Medico Industries. The minutes of November 12th were accepted with a revision of the State Revenue amount listed for the budget. Motion made by Foltz, second by Phelps and carried by three yes votes. The bill list was reviewed and approved on motion by Phelps, second by Furney and carried by two yes votes. Foltz voted no. Treasurer‘s report was filed for audit. Doug Phelps gave reported that yearly road work is done until spring except for water problems that hopefully will do fixed. Winter is now here with snow, cold temperatures and some freezing rains. Dirt & Gravel Grant is wrapped up and payment received. FEMA projects have been completed and reports have been submitted. Jim Phelps met with Matt Anderson (Williams Pipeline) and has approved their restoration work. The Board gave him approval to sign off for the Township. The Bluestone Road Agreement release was signed by the Supervisors. The Township has had the opportunity to demonstrate loaders from John Deere, Case, and CAT. Phil Medico was present and spoke for Medico Industries and what they could offer. After a lengthy discussion, Foltz made a motion to allow the Board to purchase a new loader provided through COSTARS bidding specifications or better so we can continue this process should it be Case or CAT and make a discussion. There was no second and it was then decided to recess this meeting and continue it next Tuesday to make a decision for the loader purchase issue. The old loader will be advertised for sale. Further there will be no increase in tax millage (4.63 mills for General and 1 mill for Fire Protection) also no increase in sewer rates. Furney made the second and motion carried by two yes votes with Foltz opposed. Now that the deed for the water reservoir property has been filed, we will advertise for bids for a gas lease on the 1.388 acres. Foltz made the motion and Phelps seconded and so carried by three yes votes. Lisa and Ken Schmidt have submitted a driveway application on Tyler Lake Road. Foltz made a motion based on the information provided to approve the application, Phelps seconds and motion carried three yes votes. Motion by Foltz and second by Phelps to adjourn the meeting at 8:51 PM. Then being reminded of the motion to recess, Foltz motioned to rescind his motion to adjourn and this motion was seconded by Phelps. The recessed meeting was called to order at 7:00 PM in the township office with all Supervisors present. Visitors were Ted Brewster, Conrad Owens and Steve Simko, representing Cleveland Brothers. There have been extensive discussions for the purchase of a loader with the two companies for Case and CAT. Further review of the two machines, their options, warranties, and financing have been made. After having these machines here for demonstrating, Doug Phelps felt the CAT was a better fit for our needs. Foltz made the motion to award the lease agreement for the CAT 924K loader as per specification on the quote through Cleveland Brothers, Wilkes-Barre, PA. for a total of $136,194.00. The township will pay $36,194.00 down payment and finance $100,000.00 for sixty (60) monthly payments with Caterpillar Financial Services Corporation. Phelps made a second and motion carried by three yes votes. Paper work was signed and turned over to Steve Simko. The regular meeting of the Harford Township Supervisors was called to order at 7:00 PM in the township office. Supervisors Phelps, Furney and Foltz were present. Visitors included Carolyn Jennings, Ted Brewster, Jim Phelps, Bob DeLuca, Connie Breese, Dorothy Hagenbuch, Maureen Warren, Lilli Thomas, and Pat Farrelli. The minutes of October 8, 2013, were reviewed. Foltz called the minutes vague and requested the recorded tape of the meeting be filed with the written minutes. Foltz motioned to approve as amended, seconded by Phelps and carried by three yes votes. Minutes of October 28, 2013, were approved on motion by Foltz, second by Phelps and carried by three yes votes. Bill list was approved on a motion by Phelps, seconded by Furney and carried by two yes votes. Foltz again voting no. Treasurer‘s report was filed for audit. Foltz expressed concerns on two items of the budget. That of wages and dust control. After discussions, motion was made by Furney to advertise the prepared proposed 2014 Budget, Phelps seconded and motion carried by two yes votes. Foltz voted no. Final consideration for the budget will be at the regular meeting of December 10th. Jim Phelps gave the update, currently in Section 2. Doing extensive ditch work, and coordinating FEMA projects. He hopes to get time to re-grade a couple of roads with steep hills to work out the ripples. And if the weather holds do brushing with the boom mower and clean in-lets and out-lets. The FEMA work on Oliver Road by Rutledge Excavating has started. Hopefully work will be wrapped up the first part of next week. The Dirt & Gravel Grant project on Tyler Lake Road has been inspected by Robert Fernley of the Conservation District and has been approved. All paper work has been completed and turned in, but the grant check has not been received. Furney expressed not wanting to make Barhite wait to their payment. Phelps made the motion to pay the bill for Barhite of $34,760.50, seconded by Furney and carried by three yes votes. Williams Pipeline submitted close out reports for the Tingley and Leslie Pipeline projects. When Jim Phelps has had a chance to inspect the areas the Supervisors will sign off on the projects. Bluestone Pipeline has also submitted a closeout agreement for the December 20, 2011, Road Agreement. This matter was tabled until the December meeting for Jim‘s inspection. Williams Pipeline permit application for the open cut on Plank Road was reviewed and signed by the Supevisors. The purchase of a replacement truck for the 350 utility truck as been researched and a 2014 Ford Super Duty F-350 has been discussed. The specifications and options were reviewed that have been received from Hondru Fleet of Manheim, PA. We would purchase it through CoStars program and eliminate the bidding process. Cost of the chassis would be $30,388.37 and Powell‘s Equipment will install the utility box at a cost of $6,878.42 also through Costars. Phelps motioned to order the new F350 as specified and to deliver it to Powell‘s for utility box. Second made by Foltz and so carried by three yes votes. The loader motor has locked up and Jim is gathering information on a replacement. Jim gave information on equipment tires and the Board approved having the good casings recapped for spares. A resident on Beaver Meadow Road has again filed a noise complaint at the Lopke Quarry. Another letter will be sent to Lopke‘s headquarters for the compliance of our Noise Ordinance. Also inform them of the dust problem coming from the quarry and the air quality in the valley. Foltz stated he is exercising his right as Supervisor Chair and invoking Resolution #2-02 that he has found establishing a second meeting a month on the fourth Tuesday. Therefore, a regular meeting will be held November 26, 2013 at 7:00 PM. With the renewal of our NPDES effluent discharge permit, DEP is requiring additional monitoring starting January 1, 2014. Due to these new requirements, David Klepadlo is requesting a $200.00 increase in his monthly contract. The Board has no objections to the increase. The Harford Township Supervisors met for a Special Meeting to open and award bids for the FEMA Oliver Road project and general purposes at 6:30 PM in the township office. Supervisors Furney, Phelps and Foltz and Roadmaster Jim Phelps were present. After a discussion, Foltz made a motion to award the bid to Rutledge Excavating of 88 Galilee Road, Tyler Hill, PA to do the FEMA work as described on Oliver Road. They are to provide labor, materials, and equipment, not to exceed $33,293.00. Doug Phelps seconded and motion carried by three yes votes. Additional, Foltz motioned that in the event that for any reason, Rutledge is not able to provide the work as the bond requires, we are allowed to go to the second bidder for labor, equipment and materials to Linde Corp., Honesdale. Doug Phelps seconded and motion carried by three yes votes. The 2014 Budgets were discussed and will be ready for the November meeting. A driveway permit was approved with no objection for Williams Pipeline on Tingley St. The regular monthly meeting of the Harford Township Supervisors was called to order on 7:02 PM in the township office. Supervisors Furney, Phelps, and Foltz were present. Tonight‘s visitors were Ted Brewster, Joe and Dava Cowan, Dorothy Hagenbuch, and Pat Farrelli. The minutes of September 10th were approved on a motion by Foltz, seconded by Phelps and carried by two yes votes. The bill list was reviewed and approved on a motion by Phelps, second by Furney. Motion carried by two yes votes. Foltz voting no again because of the pension for Mrs. Furney. The Auditors have sent copies of their Organizational meetings of 2004 and 2005. Both years they did indeed approve the township matching Mrs. Furney‘s pension at 3%. Now Foltz has come up with other objections. The treasurer‘s report was filed for audit. Doug Phelps gave the road report as Section 3 will be wrapped up tomorrow except for the FEMA work. The crew will be moving to Section 2. Tyler Lake Road Dirt & Gravel project has been completed. They will now meet with Conservation Dept. Robert Fearnley for the completion report. Joe and Dava Cowan attended the meeting to ask questions about this project. One question was why the project was done? And why was the pipe not put in that was called for in the plan? Phelps explained that sediment and dirt was washing done the road and ditches and going into the lake. By building up the road, and rocking the ditches the water will flow off into the fields. Mr. Fearnley visited the site during the work and determined that the pipe was not necessary. Mrs. Cowan has pictures to show that water is not collecting in the driveway that never had happened before. The road crew will look into the situation and watch for any problems. Barhite Excavating has submitted estimates for other projects in the township. They have completed the FEMA project on Wescott Road, replacing the pipe. The bridge abutment under Route 81, on Pennay Hill Road is pushing out towards the creek as has been noted on the last several bridge inspection reports. The quotes of for $8,650.00 to repair the bridge abutment. Phelps would like to see that the work is done before winter. Foltz stated he wants in writing exactly what they are going to do. For the FEMA work on Jeffers Road it was agreed to approve for Barhite to complete. Their quote was $5,630.00 to swale clean rock line with the material cost on the Township. FEMA work on Oliver Road was quoted at $30,649.50 to install 3 culvert pipes, remove dirt and clean swale ditches/banks. Rock line the ditch side and place approximately 750 tons of modified stone. The project is over the limit and must go to bid first. Motion was made by Foltz to give direction to the Road Master to proceed with Barhite Excavating to do FEMA work on Jeffers Road and to do the bridge abutment repairs on Pennay Hill Road. Seconded by Phelps and carried by three yes votes. The deed for the water reservoir and accompanying documents have been filed and the matter is finally settled. A budget workshop was held September 25th. We went through the Sewer and State figures. The next workshop will be October 22nd at 6:30 PM to continue to pull the budgets together. The regular monthly meeting of the Harford Township Supervisors was called to order in the township office at 7:00 PM. All Supervisors were present and visitors Maureen Warren, Carolyn Jennings, Ted Brewster, and Pat Ferrell. The minutes of August 13, 2013, were approved as printed on motion by Phelps, second by Furney and carried by three yes votes. The bill list was accepted on a motion by Phelps, second by Furney and carried by two yes votes. Foltz voting no. Treasurer‘s report was reviewed and filed for audit. When asked during the public comments why he voted no for the bill list, Foltz stated that he objects to the pension for Mrs. Furney. His reason being that the Auditors did not approve it. A proposal from Vestal Asphalt was sign to agree to extend the cost of liquid calcium at $1.03/gallon above the amount of gallons originally bid. The contracts for the Dirt & Gravel Grant for Tyler Lake Rd. were signed. Foltz reported that since this is a grant the bidding process is not necessary. Assessments for approved with no objections for Raymond Telnock for a barn and Samual Phillips for a pole barn. A sub-division for Glyn Kester, Orphan School Rd. was reviewed. Having no objections, the Municipal Report was signed. The Harford Fire Company 2014 agreements were accepted and signed on a motion by Foltz, second by Phelps and so carried by three yes votes. An Executive Session was held on August 30, 2013, for the purpose of personnel. A log skidder recently traveled School St. and left cleat marks on the black top. We will contact the paving company for any recommendations and will also contact the logging company that is responsible. Efforts are continuing to track down a title for the 1990 Gradall purchased in June of this year. Pennsylvania will not register this equipment without a title or MSO. Contact has been made numerous things to Gradall Company in Ohio and the dealer Weaco where it was purchased. A motion was made by Foltz and seconded by Phelps to recognize Carlton Colwell of New Milford as a full time employee effective August 16, 2013. Motion carried three yes votes. We have been served with a lawsuit that involved the bull running loose at the Harford Fair last year. It is in the hands of our insurance Attorney at this time. We have notified the Attorney that the Township has no ties with the Fair - Harford Agricultural Society. The Harford Township Supervisor‘s monthly meeting was called to order in the township office at 7:00. All Supervisors were present along with visitors - Dorothy Hagenbuch, Maureen Warren, Ted Brewster, Jim Phelps and Lillie Thomas. The minutes of July 9th were approved as printed on a motion by Foltz, seconded by Phelps and carried by three yes votes. The bill list was reviewed and approved as presented on a motion by Phelps and second by Furney. So carried by a three yes vote. The treasurer‘s report was filed for audit. The crew has finished up on Section One and have moved to Section Three. Bob Doble, Reilly Associates, has sent a second draft letter for the Board‘s approval to be sent to Northern Tier Development regarding the Lower Podunk bridge. All Supervisors agree that it is ready to send. Verbal approval of the Dirt & Gravel Grant for Tyler Lake Road has been received. Paperwork has yet to come. The clean up program for this year was given by Furney. There were 42 loads plus tires. We have received $2,384.00 from the residents involved and are waiting for the steel payment from Upstate/Weisman. We used three dumpsters at a cost of $3,658.82 for 25+ tons of waste. A letter from PEMA has given us another time extension for the FEMA projects. We now have until March 8, 2014, for their completion. A subdivision has been reviewed for the Olin Miller farm on Miller Road. It is the intend of the Miller family to sell to Williams Pipeline for a natural gas compressor station. We have also received the Development Plan from Williams Field Services for the station. The Board has no objections and the Municipal forms were signed. A Noise Ordinance Waiver from Cabot was approved for six months starting January 2014 to June 2014. This will be for the Reuss Gas Pad on Route 547. The UV system has been installed and the improvement project is now complete. Four more sewer accounts that are past due have been sent to Att. Hailstone for property liens. An Executive Session will be held immediately after this regular meeting for the purpose of personnel. The regular monthly meeting of Harford Township was called to order at 7:00 PM in the township office. All Supervisors were present. The visitors included Maureen Warren, Ted Brewster, Dorothy Hagenbuch, Lisa Schmidt, Lillie Thomas and Pat Farrelli. The minutes of June 11th were accepted as printed on a motion by Foltz, second by Phelps and carried by three yes votes. The bill list was accepted as presented on motion by Phelps, second by Foltz. And so carried by three yes votes. Treasurer‘s report was review and filed. Noted was the receipt of Impact Fees of $204,454.92. We have purchased a 1990 Gradall from Weaco Equipment of Womelsdorf, PA. and it has been delivered. Payment of $12,000 was made using Impact Fees. Road work continues with the crew now on Upper Podunk. We may need to bid for more 2A material and calcium. Also we may ask FEMA for another time extension for the necessary work on Oliver and Jeffers Roads. Lower Podunk Bridge - (executive session) We met with Bob Doble and Randy Decker from Reilly Engineering to review the latest bridge inspection report. They will be drafting a letter for our review and then continue to met with Northern Tier Regional Planning Commission. Perhaps we will quality for PennDot program for bridges. The draft letter has been received and the Board has approved. Mr. Doble will be advised to proceed. Deeds for Reservoir building - The deeds for the Water Company matter have not yet been completed. Dirt & Gravel Grant - The Conservation District will be presenting this year‘s applications to their Board next weeks. Hopefully we are in a good position to receive the grant for Tyler Lake Road. Council of Governments has sent us a Resolution to consider. This would appoint COG to administer our new floodplain ordinance. Foltz made a motion that Harford Township adopt Resolution #2-13 appointing the Susquehanna County Council of Governments to administer and enforce the Municipal Flood Plain Ordinance (#47). Furney made a second and motion carried by three yes votes. We have also been notified by COG of the issuance of a Recreational Cabin permit to Deborah Johnson for Richardson Road. We received Act 14 Municipal Notification that Williams Field Services Company is applying for a permit for Earth Disturbance associated with oil and gas exploration. This will involve the Miller Compressor Station. We will set up and meeting with Williams to review their plans. PennCan hydromatic pumps have been installed. At this time there is a need to increase the EDUs for the property. The number of EUDs for this property will increase from 16 to 25 beginning with the next billing. Accounts heading towards Sheriff‘s Sale have been given the 10 day notice for Judgement. The Ultra Violet System will be delivered July 15th. The fire hydrant that feeds directly from Tyler Lake in the center of town is out of order at this time. There is a question as to who is the owner of the hydrants. The Water Company is working on the repairs for this one. Foltz asked for an Executive Session for personnel matters to immediately follow this one. The regular monthly meeting of the Harford Township Supervisors was called to order at 7:00 PM in the township office. Supervisors Foltz, Phelps and Furney were present. Visitors were - Dorothy Hagenbuch, Dale Ferger, Lillie Thomas, Ted Brewster, Jim Phelps and Maureen Warren. The minutes for May 14th were accepted with one correction on a motion by Foltz, second by Phelps and carried by three yes votes. The bill list was approved on motion by Phelps, second by Foltz and carried by three yes votes. Treasurer‘s report was reviewed and filed for audit. It was announced that Harry Buchanan has been hired for an Operator/Driver position. Foltz made a motion to appoint Harry Buchanan, Rt. 848, PO box 484, New Milford, PA. as part time retroactive to May 22, 2013, motion seconded by Phelps and carried by three yes votes. Further, Foltz motioned to appoint Harry Buchanan to a full time position starting June 17th. Motion seconded by Phelps and so carried by three yes votes. Williams Field Service‘s road crossing applications were reviewed for the Payne Pad. One crossing is for Upper Podunk and the second for Lower Podunk. Jim Phelps has inspected the sights and there are no problems with an open cut. The Board has no objections. The need for a gradall was discussed. Two units have been found by reviewing the internet. A trip will be made to see the conditions and review the terms. The possibility of renting one has been difficult as the machines are rented for the season by the gas companies. Offers for the equipment for sale were reviewed. 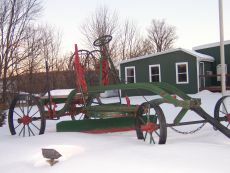 Foltz made a motion by sell the old roller to Jeff Winemiller for $350.00, to part out the York rake for use on our newer one, and sell the generator to Dave Davenport for $100.00. Phelps made a second and motion carried by three yes votes. The subdivision of Earle Gumaer was reviewed. The driveway needs to have the tail drain corrected as too much material has been added and water is unable to drain. Should sewer be required for Lot 2, it will be hooked to the sewer system. Municipal form for the Planning Commission was signed with the driveway notation. Interviews for a part time secretary have been held. Foltz made a motion to recommend and hire Carolyn Jennings as part time secretary for Harford Township effective June 14, 2013. She will be scheduled for Tuesdays and Fridays through the summer, available 9:00 to 3:30 with half hour off for lunch. Pay rate at $12.00 with no benefits. Phelps made a second and motion carried by three yes votes. Foltz will be here on the 14th as Furney will not be able to work that day. An Executive Session will be held immediately after this meeting for personal matters for reviewing applications for employment. The regular monthly meeting of the Harford Township Supervisors was called to order in the township office at 7:00 PM. Supervisors Foltz, Phelps and Furney were present with visitors Ted Brewster, Lillie Thomas, and Lisa Schmidt also attending. Minutes of the April 09th meeting were approved as printed on a motion by Foltz and a second by Phelps. Motion carried by three yes votes. Minutes of the April 16th meeting were approved as printed on a motion by Foltz and a seconded by Phelps and carried by three yes votes. The bill list was reviewed and accepted as presented on a motion by Foltz and second by Phelps. Motion carried by three yes votes. Treasurer‘s report was filed for audit. The Ultra Violet system has been ordered by Engineer Klepadlo, but before going to production it needs to be paid in the amount of $30,000.00. Also DEP requires a permit with a fee of $500.00. Foltz made a motion to continue with the sewer update, and give authority to Mr. Klepaldo to order this new UV system for our sewer facility and it will require an up front payment to them to build the system to our specifications. Second by Phelps and so carried by three yes votes. The execution of the sewer liens have resulted in payments. Two liens are now paid off and the others have had payments made against the balances. The drums of used oils are now gone thanks to Advanced Oil Recovery. Section one is now underway with the yearly maintenance with the crew working Blanding Lake Road. They will be on the Lower Podunk next. Cinder Bids: Brown Farms and Ronald Kiefer have brought in samples of the black cinders that they supply. After looking at these samples, Foltz made the motion to award the bid for black cinders to Ronald Kiefer for the course cinder material at the $12.50 bid amount. Phelps made a second and motion carried by three yes votes. The Employee Time off Policy has been revised to add to phrase "by immediate Supervisor of the Board" to the reference of unpaid time off request. The Dirt & Gravel grant application has been filed and Lisa Schmidt gave us an update. No word yet from the Conservation Department on the progress. The used equipment for sale has had no response from the legal ad. Jim Phelps connected the gentlemen who was interested last fall in the roller. If he is still interested in it for $250.00 he can have it and get it out of our yard. We will ask Jim to contact this party. Lisa Schmidt offered to place the rake and generator on Craig‘s List for us. We will need to give her the descriptions. Driveway permit application for Thomas & Anne Koes on Tingley St. has been inspection by Roadmaster Phelps. He has no objections and the application was signed by the Supervisors. A subdivision of Louis Marsico on Still Hill Road was received from County Planning. After a review, the Supervisors have no objections. County form was signed. An Executive Session will be held immediately after this regular meeting for the purpose of reviewing employee applications and legal issues with sewer liens. The Harford Township Supervisors met in the township office for a Special Meeting for bid opening and general business. Supervisors Foltz and Furney were present with visitors Maureen Warren, Ted Brewster, Lisa & Ken Schmidt, Jacob Rosen, Ethan Simons, and Jim Phelps. : Water Association - The draft deeds for the land exchange have been prepared and John Karkash dropped them off at the office for review. Attached to the deeds will be a Release of Prior Leases and Stipulation of Facts, copies of two old leases, and the new lease to the present Harford Water Association, Inc. The documents will be reviewed and several signatures will be needed before the project is completed. Dirt & Gravel Grant - Lisa and Ken Schmidt along with Jim Phelps met with Conservation District Representative, Robert Fearnley on Tyler Lake Road at the site in question for this grant. The planned work would be to raise the road bed so the runoff water will cascade off into fields and wooded areas before its gets to the lake and swamp. Mrs. Schmidt will continue to work in the grant process and keep us informed. Items the Township no longer need or use will be advertised for sale - Buffalo Springfield Roller, York stone rake, and Onan generator. Foltz stated he will get descriptions of these items for the advertising. Furney has contacted Reilly Associates for possible help with the Lower Podunk bridge that needs replacing. They will inspection the bridge and send us their findings and suggestions. Since April 10th the quarry activity at the L.S. Lopke Plank Road Quarry has been quiet after hours listed in our Industrial Noise Ordinance. They have complied with our request. Foltz would like to add to the Road Crew Duties and Responsible Policy a clause that no texting in Township equipment will be tolerated for safety purposes. He would like it to state no warning will be given, immediate dismissal. Special Fire Police for 2013 were recognized and appointed on a motion by Foltz and a second by Furney. Appointed were: Teresa Lamberson, Wayne Frederici, Terry VanGorden, Cathy Frederici, Robert DeLuca, James Batzel and Allan Sloat. Motion carried by two yes votes. Motion made by Foltz and seconded by Furney to award road material bid to Eastern Industries, Clifford, PA. as they had the overall low bids on stone materials. Motion carried by two yes votes. Motion made by Foltz and seconded by Furney to award bid for materials for work not requiring state approved materials. Motion carried by two yes votes. Brown Farms Enterprise, Tunkhannock, PA	17.90/yard - based on fuel cost of $4.00 with 1 cent increase in fuel a 2 cent increase per yard. There were questions of the types of cinders, whether fine or course. Therefore, cinder bids were Tabled. Foltz motioned to recognize and award the bids to both Vestal Asphalt and Suit-Kote Corp. for Dust control materials. Second by Furney and carried by two yes votes. Mirabito Energy was the only bidder for BioDiesel. Their quote was Fluctuating price based on the OPIS average, Harrisburg, published on Monday of the week of delivery. Foltz motioned to accept the fuel bid from Mirabito and Furney made a second. Motion carried by two yes votes. Quote for lawn care was received and awarded to Randy Ball DNR Lawncare for Township building $30.00 and sewer plant at $40.00. Motion by Foltz, second by Furney and carried by two yes votes. The regular monthly meeting of the Harford Township Supervisors was called to order by Garry Foltz in the township office at 7:00 PM. Supervisors Phelps and Furney were present along with visitors Dorothy Hagenbuch, Maureen Warren, Jamie Shave, John Ahearn and Ted Brewster. The minutes for the March 12th meeting were accepted as printed by motion from Foltz, second by Furney. Motion carried by three yes votes. Also the minutes of the March 19th continuation meeting were accepted as printed on motion by Phelps, second by Foltz and carried by three yes votes. The Bill list was approved on motion by Foltz, second by Phelps and carried by three yes votes. Treasurer‘s report was reviewed. Noted was the loan for $150,000.00 in the sewer account. Funds were replaced as needed from previous transactions. Report was filed for audit. Dave Klepadlo was present to report on the sewer. The improvement project is completed in November except for the UV system. He has been looking to in increase electric usage. It is difficult to do a comparison when the actual meter reading is done every other month. Adjustments have been made to the blowers, a blockage in the return line was cleared, and the building heaters were turned down for the summer. Dave and Joe met with representatives from the E-1 pump manufacturers who now admit that they have found a problem with pressure switches and valves in the pumps purchased in 2008 & 09. They manufacturer will have a team here to make the necessary repairs on April 16th. A new Duplex system is needed at the Penn Can Truck Stop. This will be further discussed at a meeting with Dave & Joe on Thursday April 11th. The Board gave the ok for Dave to order check valves and five new Extreme E-1 pumps for stock. Jamie Shave representing Cabot was here tonight to have Conformation of Ownership, Lease Ratification and other necessary paperwork signed. This involves the 10+ acres at the ball field that will be included in the Adams gas well unit. Mountain View correspondence concerning the placing of a sign for the champion Soccer Team has been further questioned. The school wants the two sided sign placed in front of the school on Route 106. They have been in contact with PennDot also. If they want it on their own property there is nothing more to be approved. Township could help if needed. Regarding the request for funds to support a security office, further information will be received from the School. The Township Auditors have submitted their report for the 1012 audits. Everything was favorable and a copy of their report is attached to the recorded minutes. Montrose Borough has requested the assistance from our Special Fire Police to direct traffic and crowd control for parades on Memorial Day and July 4th. Motion was made by Phelps to allow Harford Township Special Fire Police to assist Montrose Borough, seconded by Foltz and carried by three yes votes. The annual grant opportunity has been received from County Conservation District. Lisa Schmidt has contacted the Township about road materials washing into Tyler Lake and the swamp area. She is willing to do research on a possible solution and help with the grant process. It was agreed to have the information to Mrs. Schmidt for her review, see what‘s involved, and keep us informed. We received a noise complaint from a resident on Beaver Meadow Road. The Lopke quarry has been working over nights and causing excessive and offensive noise levels. Foltz made a phone call to the Manager of that quarry operations and reminded them of our Ordinance involving Industrial Noise. He was apologetic and said he would speak to the crew at the quarry. However, it appears that the activity has continued. Foltz will draft a letter that will be sent to the company with a copy of our ordinance. Phelps asked to set the dates for this year‘s Clean Up Program. It is now set for the first week on June. June 3rd until all stops are made. Cost per load will remain the same as 2012 as well as tire costs. The Area Agency on Aging was asked for funding to help with the cost of providing for Senior Citizens in our township. At this time, the Board feels it is not in our budget. With the need for another full time road crew member, it was decided to have Jim Phelps review employment applications now on file. If that does not work out we will advertise for another employee. There will be an Executive Session following this meeting for the purpose of legal matters and personnel. Phelps made a motion to continue this meeting on Thursday April 11, 2013, at 6:30 PM to meet with Dave Klepadlo and Joe Sheposh to review sewer matters. Foltz made a second and motion carried by three yes votes. Supervisors Foltz and Furney met with Dave Klepadlo and Joe Sheposh to continue the regular monthly meeting. Ted Brewster also joined the group that was called to order at 6:30 PM by Garry Foltz. Tonight‘s discussions were sewer related matters. The Sewer Rate Resolution of 1993 was reviewed and different users were discussed as to the number of EDUs that are being charged. There was a lengthy discussion concerning the pumps around the system. Klepadlo made available his map of the system showing were Hydromatic, E-1 2000, and E-1 Extreme pumps are in use. He will have a copy made for this office after the representatives from the manufacture has made repairs on April 16th. Five faulty check valves in various locations will be replaced when it can be scheduled. The set up at the Penn Can Truck Stop and restaurant was again discussed. Klepadlo has inquired and found that Benton/Nicholson Sewer Authority is willing is sell us two hydromatic pumps for $2000.00 each. Dave explained that replacing the current pump with two hydromatics would be more feasible than a completely new set up with E-1 Extremes. Furney had discussed this matter with Phelps earlier in the day and he will support this move as well, therefore, the Board approved this purchase and Klepadlo and Sheposh will move ahead. The regular monthly meeting of the Harford Township Supervisors was called to order at 7:02PM in the township office. Foltz called the meeting to order with Supervisors Phelps and Furney present as well as visitors Maureen Warren, Ted Brewster, Pat Farnelli, and Jim Phelps. Minutes of February 12th were approved as printed by motion from Phelps, seconded by Furney and carried by three yes votes. Likewise minutes of February 13th were approved as printed on motion by Foltz, second by Furney and carried by three yes votes. Bill list was accepted on a motion by Phelps, seconded by Foltz and carried by three yes votes. Treasurer‘s report was reviewed and filed for audit. Ordinance #47 - The proposed ordinance for the National Flood Insurance required by FEMA was sent to DCED for review and has been approved and advertised. Foltz made the motion to adopt Harford Township Ordinance #47, Furney seconded and motion carried by three yes votes. Cabot Noise Waiver - The application that was presented at the February 12th meeting was again discussed. Foltz would like to limit the time period for Industrial Noise Waivers to six months. This matter was tabled until previous waivers can be reviewed for the time periods. The Susquehanna County 2012 Hazard Mitigation Plan is adopted as the official Hazard Mitigation Plan for Harford Township by Resolution # 1-13. Motion to adopt this resolution was made by Foltz and seconded by Furney. Motion then carried by three yes votes. A subdivision was received from County Planning for John Karkash and Harford Township for the property boundary swap was reviewed. The Board has no objections, form was signed. Two letters have been received from Mountain View School. Since our Soccer team was 2012 State Champions, the school would like to erect a sign for that honor. It was decided to ask some questions of the school‘s ideas for where to place these sign. In their second letter, the school is asking that each district consider contributing $12,500.00 for the school to be able to hire School Resource Officer. They are asking each municipal and borough to allocate this amount. Further information is needed before the Board will move on this issue. A driveway application was approved for Samual Phillips on Wilcox Road. Foltz looked at the completed driveway and reported that it looked good. Driveway permit approved with no objections. Engineer David Klepadlo left messages concerning the sewer lines. Five check values are bad and need replacing. Four are in town and in difficult places to access. He is asking how we prefer to handle the repairs. No decision was made. The Penn Can will need new duplex pumps soon. And the Board gave the ok to purchase necessary anti-siphon valves. Eric Allen has accepted another job offer and has submitted his resignation with March 14, 2013 as his last day of employment here. Foltz made the motion to accept Mr. Allen‘s resignation with regret and wished him luck, seconded by Phelps, the motion carried with three yes votes. After having conversations with Jim Phelps, Foltz made a motion to appoint James Phelps to the position of Harford Township Road Master as of March 15, 2013. Motion was seconded by Furney and so carried by two yes votes with Doug Phelps abstaining. Jim was welcomed aboard in his new position. At the Organization Meeting of this year, we recognized Lynn Adams and Carl Colwell as part time employees. Jerry Yushinsky and Matt Damiano will also be added to that list by motion from Foltz, second by Phelps and carried by three yes votes. Road materials for this year need to be discussed with the Road Master before we advertise for bids. John Michaels expressed concern with the amount of gravel on School Street that was spread for antiskid this winter. There are large pieces and a large amount still on the street. It was explained that we intend to sweep the street and scoop the material up and bring it back to the yard. Since there is more business to discuss, Foltz announced that instead of adjourning this meeting it will be continues next Tuesday March 19th at 6:30 PM. Foltz made a motion to that effect and Phelps seconded. Motion carried by three yes votes. The regular monthly meeting continued at 6:30 PM. with Phelps, Foltz and Furney attending. The office working with the National Flood Insurance contacted us regarding the omission of the effective date on our Ordinance #47. Foltz phone the representative and inserted the date and faxed a copy to their offices. Therefore, Foltz made the motion to amend the original adoption of Ordinance #47, to state under Section 10.01- Adoption -the date of April 1, 2013, will be inserted. That section now will read "This Ordinance shall be effective on April 1, 2013, and shall remain in force until modified, amended, or rescinded by Harford Township, Susquehanna, Pennsylvania". Phelps made a second and motion carried by three yes votes. The Noise Waiver for Cabot on the Payne Pad was again reviewed. Previous Waivers have been approved with varying time periods. Cabot‘s Noise Waiver for the Payne Pad was approved for a period of one year maximum. up to 6000 gallons of Biodiesel for road equipment. Phelps made a second and motion carried by three yes votes. Foltz asked to modify for clarification a section of Resolution 3-12- the Employee‘s Time Off Policy. Under paragraph seven change to read Time off taken by full time employees may be taken as "unpaid time ", if prior request and approval is granted by immediate Supervisor or the Board. A Special Meeting was called to order at 7:00 PM in the township office by Chairman Foltz. Supervisor Furney was in attendance. Tonight‘s meeting was to review and prepare an ordinance for the Pennsylvania Flood Plain Management Act. A review of the lengthy model ordinance was done, making changes, additions, and revisions wherever necessary. After the Board felt the ordinance had been completed for Harford Township, Foltz made a motion to have DCED review our proposed Ordinance #47, advertise as required and schedule it for adoption. Seconded by Furney and carried by two yes votes. The regular monthly meeting for the Harford Township Supervisors was called to order at 7:00 PM by Chairman Garry Foltz in the township office. Supervisors Phelps and Furney were present along with visitors Maureen Warren, Jim Phelps and Ted Brewster. Minutes of the January 7th Reorganization meeting were accepted as printed by motion from Phelps and second by Foltz. Motion carried by three yes votes. The minutes of January 7th regular monthly meeting were also accepted as printed on motion from Phelps, second by Foltz. So carried by three yes votes. Tonight‘s bill list was approved for payment by motion from Foltz, seconded by Furney and so carried by two yes votes. Phelps stepped out of the meeting for a few minutes. Treasurer‘s report was reviewed and filed for audit. Terrorism Insurance coverage - Furney made a motion to reject the Terrorism Insurance coverage through Selective Insurance Co. as we have done the past years. Phelps seconded the motion and it carried by three yes votes. The list of Per Capita Exonerations for our tax collector was reviewed and accepted on motion by Foltz and seconded by Phelps. So carried by three yes votes. A Noise Waiver was granted to Cabot Oil & Gas for the Payne Pad as presented to us on a motion by Foltz, second by Furney. Motion carried by three yes votes. A letter from Harford/Lenox Baseball Association was read asking for the yearly donation. Motion was made by Foltz to offer and donate to the Association, $500.00. Second to the motion made by Phelps and carried by three yes votes. Furney reported that our requests for time extensions for the FEMA projects have been accepted. Work must now be completed by August 8, 2013. Past due accounts were reviewed and discussed. Of the ten liens now in place, seven will now be sent to Attorney Hailstone to be executed. The Board will hold a special meeting tomorrow night to review the Floodplain Ordinance that is required by FEMA. The Regular January meeting of the Harford Township Supervisors was called to order in the township office at 7:22PM. Meeting was held immediately after the Annual Organization meeting with all Supervisors present. Minutes of the December 11, 2012, meeting were accepted as printed on motion by Phelps, second by Foltz. Carried by three yes votes. Minutes of the December 28, 2012, meeting were accepted with a correction that motion to approve Resolution 6-12 was made by Foltz. Motion seconded by Foltz and carried by three yes votes. The bill list of December 31, 2012, was approved by motion from Phelps, seconded by Foltz and carried by three yes votes. The bill list of January7, 2013, was approved by Phelps, seconded by Foltz. Motion carried by three yes votes. Both the December 31, 2012, and January 7, 2013, treasurer‘s report were reviewed and filed for audit. It was noted by the sewer expenses for office use ($1000.00) and secretary‘s salary ($6000.00) has not yet been transferred to the general funds. Because the Harford Municipal Authority must have a five member board, the Supervisors have been asked to appoint two additional members. Motion by Foltz to appoint Ethan Simons to a term of three years and Joanne Smith to a term of four years to serve on this Board. Motion seconded by Phelps and carried by three yes votes. Jim Phelps accompanied representative from Williams Pipeline and Western Land Services to inspect driveway and road crossing sites. The Board reviewed these applications and approved and signed the form. Permission will be given to close certain roads during the constructions. Motion by Foltz to recognize the IRS rate for approved mileage reimbursement at $.565. Motion seconded by Phelps and carried by three yes votes. Eric Allen was welcomed back from his July injury as of January 3, 2013. A Thank you to Jim Phelps for the fine job he has been doing. During the Christmas holiday and that week the crews were called to deal with a snow storm. The grader needs a water pump and Al Cathy will be called to make the repairs. The plow frame for the front of the grader is here and we now will need the pins necessary to mount. Allen asked about tire chains for the trucks and was given permission to order a set for each truck. Also rubber cutting edges for the plows. After a discussion regarding the black cinders delivered by Al Romanski, Phelps asked that we order an additional 500 yards. Permission given. As a good will gesture the Board agreed to make a donation to True Friends Animal Welfare Center of $200.00. The Annual Organizational Meeting of the Harford Township was called to order at 7:00 PM in the township office. Supervisors Foltz, Furney and Phelps were present. Visitors were Maureen Warren, Jim Phelps, Eric Allen, and Jim Schuster. Motion by Foltz, second by Furney to appoint Phelps Temporary Chairman. Motion by Phelps, second Foltz to appoint Furney Temporary Secretary. Motion by Phelps, second by Furney to appoint Foltz as Chairman for the year 2013. Motion by Furney, second by Foltz to appoint Phelps as Vice-Chairman as for year 2013. Motion by Foltz, second by Phelps to appoint Sue Furney as Secretary/Treasurer. Pay to be set by the Harford Township Auditors. Motion by Foltz, second by Furney to recognize the employees as Eric Allen, Jim Phelps, and Brad Marvin as full time and Lynn H. Adams and Carl Colwell as part time. Motion seconded by Phelps. Motion by Foltz, second by Furney to table the employee pay rates until Supervisors can meet with the employees. Motion by Foltz, second by Phelps to appoint Eric Allen as Roadmaster. Motion by Furney, second by Foltz to appoint Doug Phelps as Assistant Roadmaster. Township Auditors will set the pay rate for Assistant Roadmaster. Motion by Foltz, second by Phelps to set the Treasurer‘s Bond at $900,000.00. Motion by Foltz, second by Phelps to reappoint Kreder Brooks Hailstone LLP, with Att. Andrew Hailstone and Att. Jamie Hailstone as council of record. Currently hourly rate will be reviewed by the Board. Motion by Foltz, second by Furney to appoint Dorothy Hagenbuch to serve as Chairman of the Vacancy Board. Motion by Furney, second by Phelps to recognize and appoint Peoples Neighborhood Bank for all financial account and funds. Motion by Phelps, second by Furney to establish the regular monthly meetings for the township supervisors to be held at the Township office at 7:00 PM on the second Tuesday of each month and additional workshop meeting held as necessary and will be advertised. Motion by Foltz, second by Furney to appoint Doug Phelps as the voting delegate to the annual conference. Motion by Foltz, second by Phelps to establish the paid hold holidays for the employees for the year 2013 as: May 27th, Memorial Day; July 4th; September 2, Labor Day; November 28th and 29th, Thanksgiving Day and the day after; December 25th Christmas; half day on December 24th and 31st; and January 1, 2014, New Years Day. All motions were approved by three yes votes. Harford is a rural township in Susquehanna County, located in the heart of northeast Pennsylvania's Endless Mountains.